Today’s “In the studio” explores Claudia Alvarez’s studio practice during diverse residencies. 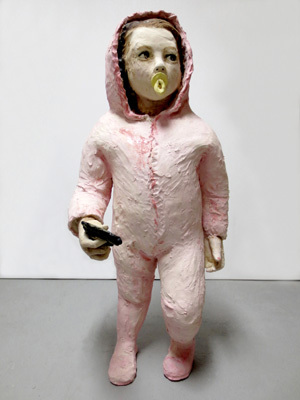 Alvarez’s residencies and awards include the Barbara Deming Memorial Fund, the Art Students League, and Art Matters Foundation, all based in New York; SASAMA, Shizuoka, Japan; SOMA, Mexico City, Mexico; and The McKnight Foundation grant for a residency at Northern Clay Center, Minneapolis. Three additional awards by invitation are PV Art, Puerto Vallarta, Mexico; Gruber Jez Foundation, Cholul, Mexico; and FUTUR near Zurich. Castro: What have been your favorite residencies for sculpture? Alvarez: Every studio I’ve worked in has been a meaningful experience. My favorite is the Bemis Center for Contemporary Arts in Omaha, Nebraska. I had a large private live/work space for drawing and painting and a great sculpture facility across the street. 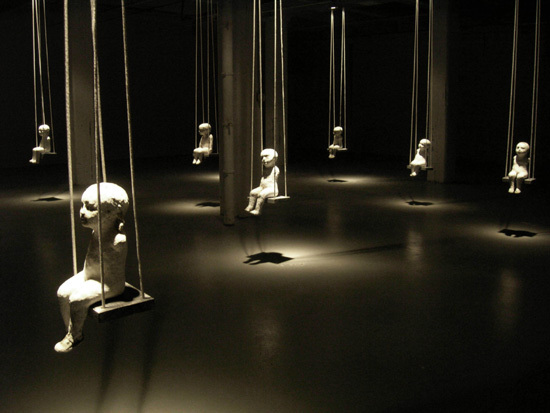 At the end of my residency, I exhibited 14 sculptures in a large gallery (See Falling Rope of Silence, 2005, Ceramic, wood, and rope). Castro: How did settings and environments in Mexico and in Switzerland affect the work you made? Alvarez: My experiences in Switzerland and Mexico were different. In Switzerland, I was completely alone at FUTUR Residency, on the top floor of a restored 13th century building with glass elevators. The village of Rapperswil near Zurich was founded in 1220. I did not know the Swiss-German language but most people spoke to me in Spanish, and I eventually made friends. The 6-month residency allowed me time to write my MFA thesis and to develop a new body of work. I spent the first 3 months walking around the village, reflecting, writing, thinking, and drawing. I was able to gesso and create large 7’ x 6’ drawings and paintings using oil and graphite. At FUTUR, I exhibited a series of 15 large paintings titled Sojourn, a dozen sculptures (made with available materials such as wood, wire, and plaster), and a few hundred small sculptures of feet (made of paper pulp from old newspapers). For the first time, I photographed my sculpture in an outdoor environment — along the village walkway, near the lake, in front of a 13th century church, and near an ancient castle. My studio in Mexico City was different. Through a grant from Art Matters to research Pre-Columbian ceramics and have an exhibition, I had to find a studio for 3 months. Friends helped me discover a live-work studio to rent. It was in a community of great Mexican ceramic artists such as Javier de Cueto and Jimena Granados. works at the Museo Nacional de Antropologia, the Stavenhagen Collection, and Museo Anahuacalli, which houses Diego Rivera’s private collection of 60,000 pre-Hispanic works. I discovered correspondences between some works I was making and those created long ago. One sculpture of mine titled El Chingon depicts a boy smoking. I discovered a sitting figurine of a boy smoking believed to be from the northern region of Mexico Culturas del Norte, created around 200 B.C. I approached other works more directly, for example, sculpture titled, Sentada, was influenced by a seated girl believed to be a young goddess from the Occidental period around 1500 B.C. The most influential works were the tiny figurines collected by Kurt Stavenhagen. Their modest scale and content were captivating, intimate, and reflected everyday family life of people playing music, sports, cooking, dancing. They depicted intimacy between couples, conveyed love between humans and their dogs, and placed women in places of honor in society. 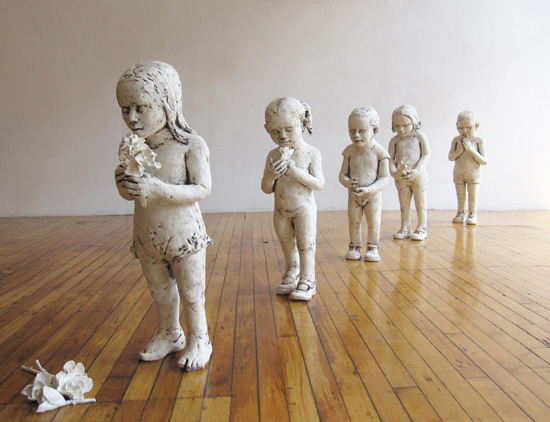 The ceramic figurines referenced happiness, suffering, the young, old, and the sick, both in individual and community settings. I returned from Mexico with a deeper sense of meaning in my sculpture. After my research and work, I did a one month residency at SOMA (provided through Art Matters by conceptual artist Joshua Okon, founder of SOMA), a lecture at UNAM Universidad Nacional Autònoma de México, and a solo exhibition titled, Acercáte at Centro Nacional de las Artes resulting in an exhibition catalog titled, Acécate ISBN 978-0-692-20841-0. Castro: How hard is it to set up a studio and to produce work in a limited time frame? Alvarez: Stepping into a new environment and working in an empty studio is thrilling, especially if I have a deadline. I arrive with a few tools in my hand. Depending on the availability of the studio, I order large rolls of watercolor paper, a roll of canvas, or at times 600 pounds of clay. Then I start working. A new and unfamiliar place fosters a desire and search for meaning. I rely on intuition, memory, and understanding of the material I will use. It also allows me to reveal my immediate thoughts and to make something out of nothing. A lump of clay turns into psychological emotions and gestures. A blank canvas or paper narrates pictures, questions meaning, and searches for a hint of familiarity. It also allows me to see the work differently and possibly respond in a new way. Castro: What are your plans for your month-long Japan residency in November, 2015? Alvarez: I was invited to participate in an international symposium which turned into a one month residency in a village in Shizuoka, in Shimada City near Tokyo. This includes an exhibition, demonstration, lecture, and international symposium. My goal in Japan is to explore larger scale sculpture in public spaces. Most importantly, I will work directly on site, which means I do not need to move the work into a kiln. Instead, a kiln will be built around the sculpture, and it will be fired outdoors for permanent installation. Formally, I will be able to create more complex compositions. My goal is to create five works possibly depicting women and children that are connected. My current series of maquettes titled Mother and Child range in size from 5” x 6” x 8” to 14” x 18” x 12”. Religious paintings with the same title that I’ve seen through art history led to sculptural works addressing complex relationships ranging from domestic violence to the love between mother and child. 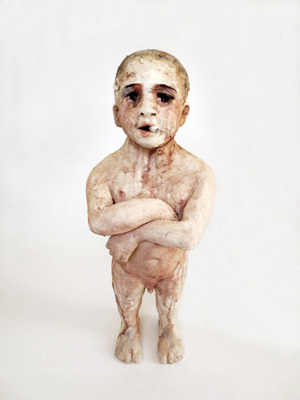 El Chupon 2, 2013, Glazed stoneware, 35″ X 17″ X 14 1/2″. Castro: What are the best places to find out about residencies? Castro: Do you frequently sell work during residencies? Alvarez: Sometimes a residency program is a great place to meet art lovers and patrons of the arts. Castro: Are there added expenses not covered by the residencies? Alvarez: Each residency differs in what it offers in terms of studio facilities, length of stay, stipend, and room and board. I recommend carefully reading before applying. Most residency programs do not cover the cost of travel or personal expenses. Some places include travel expenses in the grant. One must consider travel expenses, living expenses, and the return shipping of artwork. I recommend applying for additional funding. WWW.foundationcenter.org is a good place to start. In addition to artist residencies, exhibitions and sales, Alvarez teaches children and exhibits at Rush Philanthropic Arts Foundation. [i] Alvarez quoted in Who’s Afraid of Modern Art? By Dan Seidell (Eugene OR: Cascade Books, 2015), p. 121. I am so proud of you Claudia I’ve have been so lucky to see you from the beginning. When you first told me you wanted to be an artist. I”be seen you grow throughout the years and your sculptures, paintings, drawing and many other art creations you’ve made are just amazing! All I want to say is I am so proud of you and I love you! I didn’t know this artist. I find her work extremely moving.